Note: Curbside garbage and recycling will be collected on Monday. Airport: Office closed. Jet Air (FBO) will operate regular hours. Details at icgov.org/airportinfo. Library: Open from 10 a.m. to 6 p.m. No Bookmobile service. Parking: Normal operations. Details at icgov.org/parkingoptions. Parks and Recreation: Administrative Offices closed. Recreation centers and pools will operate regular hours. Details at icgov.org/pr. Police: Normal operations. Records and administrative offices closed. Senior Center: Closed and no senior meals. Trash & Recycling: Normal operations. Garbage and recycling will be collected. Transit: Normal operations. Details at icgov.org/transit. Residents with a water emergency should call the 24-hour emergency line at 319-356-5166. 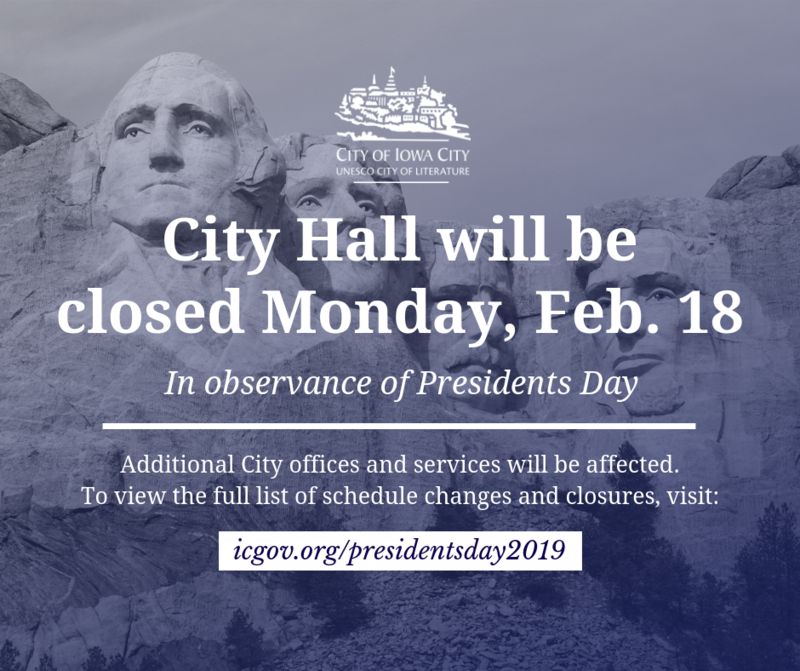 City offices and operations will return to normal schedules on Tuesday, Feb. 19, 2019.